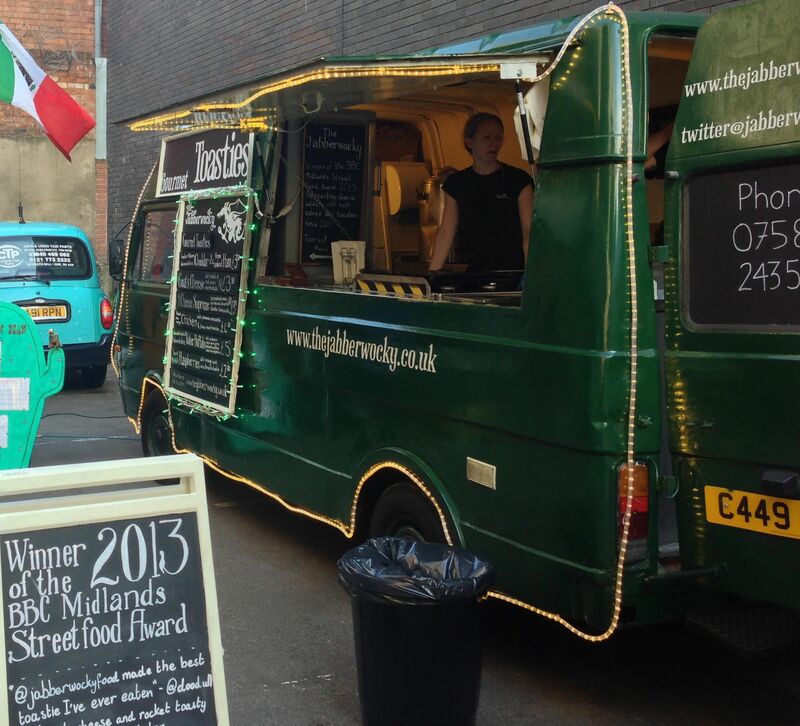 Digbeth isn’t known as an area of the city where one frequents for gourmet grub, but many of our twitter followers have raved about the Digbeth Dining Club, a weekly street food event at The Spot*light centre just next door to The Custard Factory. On a Friday evening from 5.30 some superb producers turn up with their wares to serve from gazebos and vans to those in the foodie know. The line up changes each week and you can check out the website (http://www.digbethdiningclub.co.uk) to see what’s on offer. They’ve actually been going for a year already, in fact Friday was their 1st birthday party. So well done to the organisers for getting it off the ground and so very popular in just twelve months. 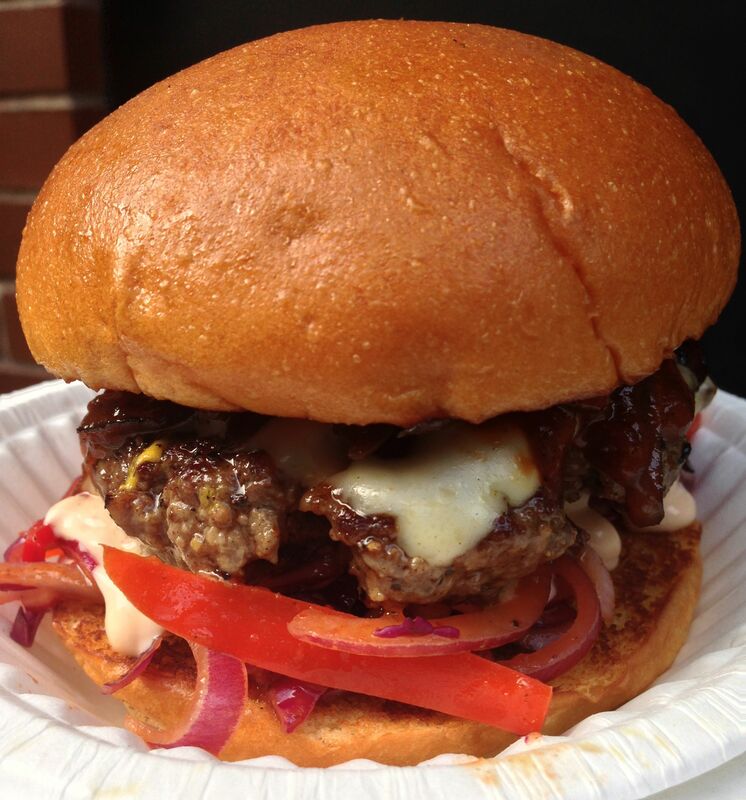 A particular favourite of seemingly everyone who goes are the burgers from The Meat Shack, whose tagline is “dripping filthy goodness”. I tried one and was not disappointed. 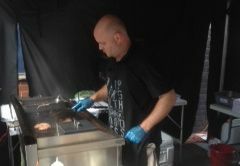 The burgers are cooked to order and watching chef Paul Collis produce them is like watching an artist at work: squeeze, grill, salt, pepper, mustard, slaw, bun, steam – each one gets the attention of an oil painting, and you can taste the care that’s gone in to them. I had the “Sassy Red” which comes with a bacon relish – wowser. A burger wouldn’t have been complete without a beer and the Spot*light is on hand with a full bar including Amstel and Tiger. We tried some Thai food from Budda Belly including some vegetable spring rolls (properly crispy like they should be), fishcakes (super-fishy with that odd but not unpleasant Thai fishcake texture), and a pork curry. 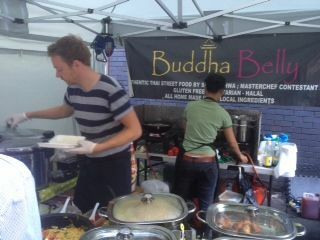 The chef from Budda Belly was a Masterchef contestant in 2012. We also tried a toastie from Jaberwocky Gourmet Toasties. I was a bit worried that Platinum Pancakes wasn’t getting busy but then realised that they were being eaten as a dessert so were busy once people had eaten a main from one of the other vendors. All of the dishes are around £5 to £6 so it’s quite an affordable meal out, and is really good value given the quality of the food. There is live music some weeks, and there are table inside and out so the weather won’t kill it. It is a bit tricky to find, so my directions are, walk up High Street Deritend, pass the Custard Factory on your left, and turn an immediate left up Heath Mill Lane just before the Old Crown Pub. About 50 yeards down the road on your right are some big blue gates, and you’ll see all of the stalls beyond them. This entry was posted in Area: Digbeth, Cuisine: Modern Mixed, Price: Cheap as Chips - Inexpensive, Venue type: Bar, Venue type: Cafe, Venue type: Cocktail Bar, Venue type: Entertainment, Venue type: Restaurant and tagged Birmingham Custard Factory, Birmingham Restaurant, birmingham restaurant review, birmingham review, Birmingham Street Food, Birmingham Streetfood, Digbeth Street Food, Digbeth Streetfood, Out In Birmingham, out in brum, restaurant review, Where To Go In Birmingham. Bookmark the permalink.